Sarah Janice Kee (1908-1998) was inducted into the Wisconsin Library Hall of Fame in 2009 primarily because of her work as Secretary of the Wisconsin Free Library Commission (WFLC) from 1956 to 1965. During Kee's tenure at the Commission, Wisconsin established the foundation for its current seventeen federated public library systems. In seeking to find out more about Kee a number of years ago, I was able to obtain a copy of a travelogue written by Kee titled Around the World in 80 Years: A Travelogue Interspersed with Anecdotes (unpublished, 1997). As the title suggests it is a record of Kee's travels around the world during her lifetime, but it also chronicles a remarkable library career. Kee was a native Texan and ended her library career in Texas. In regard to her travels, Kee writes: "It has been my privilege to see much of the world in my life time. My methods of travel have been in a swing seat in a covered wagon, a buggy, surrey, the back seat of a Model T - Ford car, both slow and fast trains, the driver's seat in a Ford, Chevrolet, Frazier and Oldsmobile, both slow and fast airplanes and a Cruiser in the Mediterranean sea." 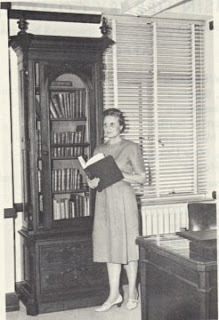 From her rural Texas roots, Kee embarked on a library career with her first library position in the Library Service of the Air Force during World War II. She did so well that she was eventually promoted to Command Librarian supervising 35 post libraries. She went to work for the Missouri State Library in 1947, and again did so well that she was designated Acting State Librarian when State Librarian Katherine Mier retired in 1948. Unfortunately, it was only "until a man could be found for the job". According to Kee the man they found "knew nothing - I mean nothing about State Library work". Lucky for Wisconsin she left Missouri and came to Wisconsin for her first stint at the WFLC. She entered the national library arena in 1952 as Executive Secretary of the Public Library Division of the American Library Association, a position she held until she assumed leadership of the WFLC in 1956. Kee concluded her library career as Library Program Officer (classified as a GS-14) with the U.S. Department of Education at the regional office in Dallas, Texas. At her interview for the position in Dallas with the Head of the Regional Office, according to Kee "a political appointee - one of those good-ol-boys who was retired from a Superintendent's position", she was told "'Miss Kee, do you realize I have MEN on my staff who are not GS-14s?'" She reminded him that she would be taking a pay cut if she took the job. She got the job anyway. Although Janice Kee wrote her travelogue primarily for her family, I feel fortunate to have shared via the travelogue in her travel and library career experiences. I wish more people could do the same. The original manuscript is located at the School of Library and Information Studies at Texan Woman's University where Kee got her MLS and established the S. Janice Kee Library Scholarship Fund.